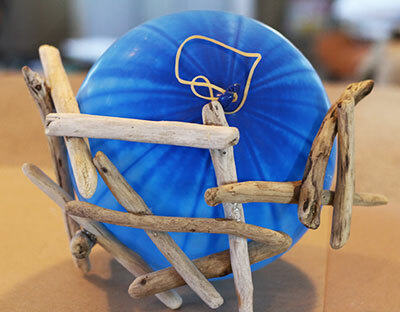 I wanted my driftwood orb to be about 10-12″ in diameter so I had to use a balloon. I found “Punch Ball” balloons at Walmart for about $3.00 for a package of 8 which were strong enough and allowed me to get the size I wanted. 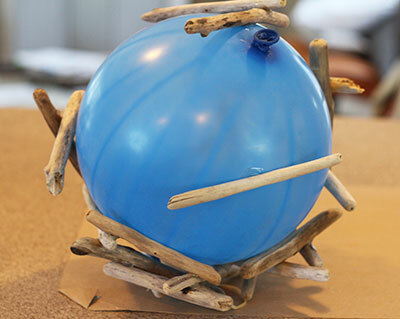 Once a blew up the balloon to the size I wanted, I tied it off so that I would be able to untie it easily enough to let the air out slowly when I was done instead of just popping the balloon. 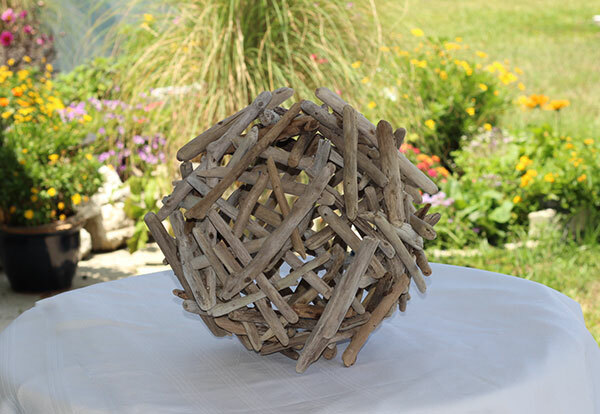 My driftwood ball is about 10″ in diameter and I used 100 pieces of driftwood for my project. 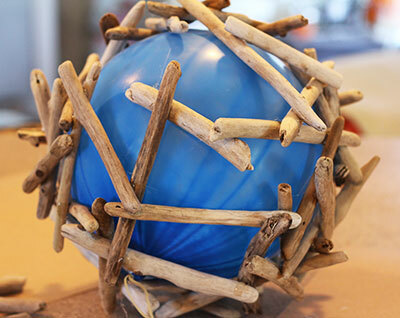 If you live in a hot, humid climate like Florida, you will find that regular glue sticks will not hold up and your driftwood orb will quickly fall apart so it is important to use professional glue for “all temperature”. 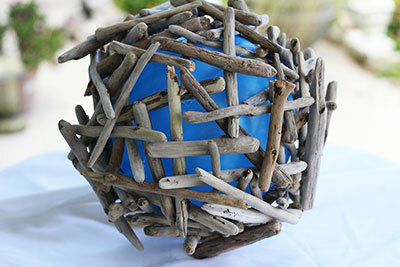 This will also allow you to use your driftwood orb or driftwood ball outside without it falling apart. 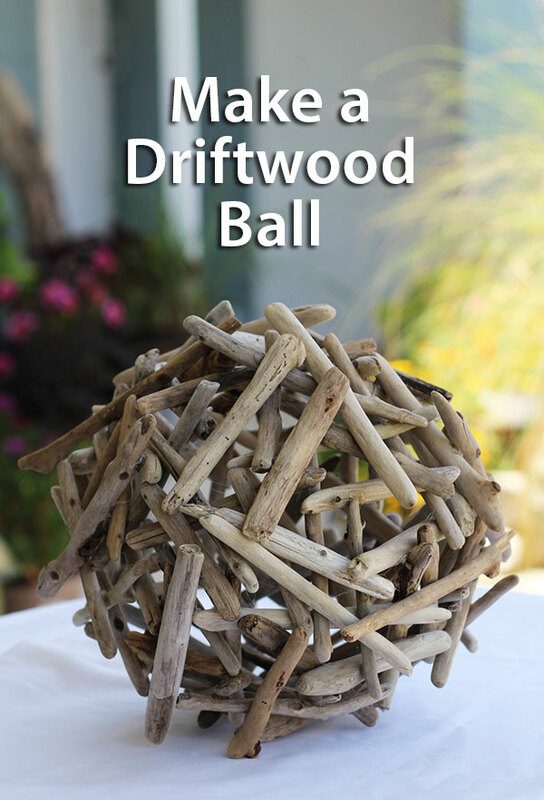 Once you’ve created your driftwood orb, the possibilities are endless as far as what you can do with it. Certainly, it’s decorative and quite textural by itself but add a string of LED lights or even just one bulb and you’ve got a unique light source. Attach dirt wrapped in moss using wire or fishing line and insert some succulent plants and you’ve now got a unique planter. Or just use it as a sculptural garden element. 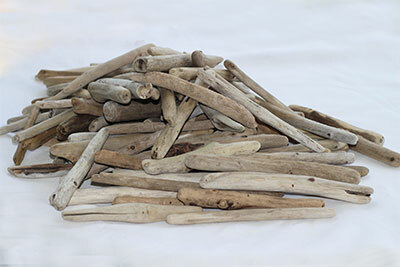 Whatever you decide, you now have a clever and decorative driftwood element.